Ten new beds are expected to be bought for the Colonial War Memorial Hospital’s Children Ward. This is after two United States owned companies – Sustainable Mahogany Industries Limited and Pacific Western Timbers (Fiji), donated a combined sum of $35,000 on Tuesday. 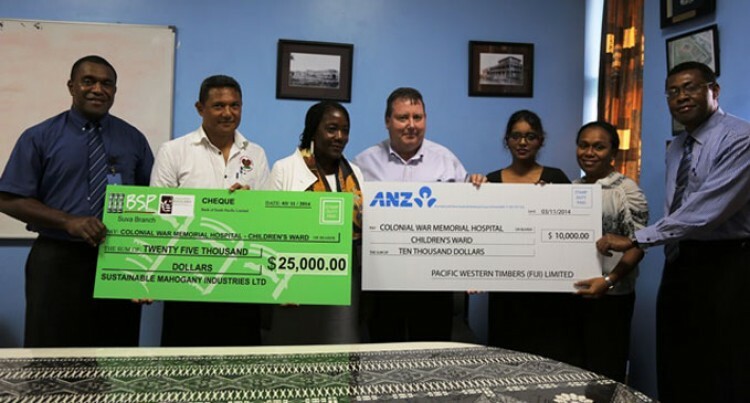 “We are very grateful to John Wagner and his company who has followed up their donation efforts in 2012 with another donation of FJ$35,000 towards the Children’s Ward,” the hospital’s medical superintendent, Dr Jemesa Tudravu, said. “CWM Hospital and particularly paediatrics services is fortunate to have Mr Wagner as a strong supporter of children’s health. He has a genuine concern for health care delivery to children. Dr Joseph Kado, CWMH consultant paediatrician and head of the department of paediatrics, said the donation was timely. The United States Ambassador to Fiji, Frankie Reed, thanked the companies for their donations to worthy causes like the Women in Business and the hospital over the years. She also thanked the Ministry of Health and CWM Hospital for their efforts to improve the health of children in Fiji.